Lewie Polk Steinberg (September 13, 1933 – July 21, 2016) was an American musician best known as the original bass guitar player for the soul music group Booker T. & the M.G.'s. He was born in Memphis, Tennessee. Steinberg was in the group from 1962 to 1965. He was featured on "Green Onions" and its B-side, "Behave Yourself", and the album Green Onions. He recorded one more album with the band, Soul Dressing, in 1965. Unlike the first album, every track but one on Soul Dressing was an original. About that time, Steinberg left the group and was replaced by Donald "Duck" Dunn. 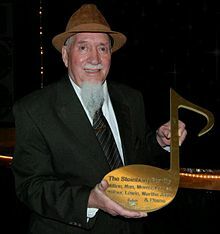 Steinberg was inducted into the Rock and Roll Hall of Fame in 1992 and received a Grammy Lifetime Achievement Award in 2007. He lived in Memphis. Steinberg died on July 21, 2016, in Memphis, at the age of 82. ^ Profile: Booker T. and the MGs Archived 2011-07-07 at the Wayback Machine. About.com. ^ Mehr, Bob (February 12, 2007). Stax Stacks Up at Grammys. Memphis Commercial Appeal. This article about a United States bass guitarist is a stub. You can help Wikipedia by expanding it.